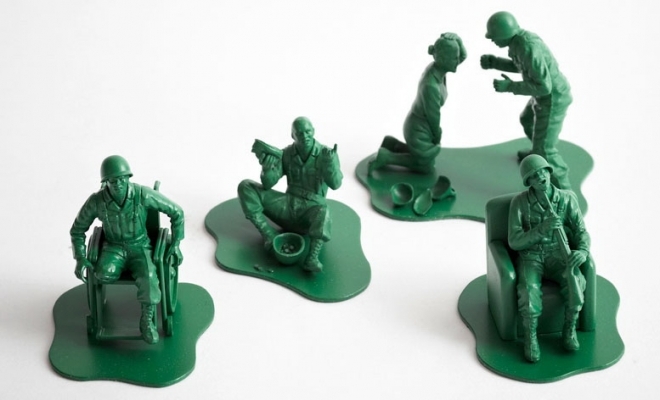 UK-based art studio Dorothy has released Casualties of War - a 10-set limited edition of 4 resin figurines depicting soldiers suffering of posttraumatic stress disorder. The hell of war comes home. In July 2009 Colorado Springs Gazette published a two-part series entitled “Casualties of War". The articles focused on a single battalion based at Fort Carson in Colorado Springs who, since returning from duty in Iraq, had been involved in brawls, beatings, rapes, drunk driving, drug deals, domestic violence, shootings, stabbings, kidnapping and suicides. Returning soldiers were committing murder at a rate 20 times greater than other young American males. A separate investigation into the high suicide rate among veterans published in the New York Times in October 2010 revealed that three times as many California veterans and active service members were dying soon after returning home than those being killed in Iraq and Afghanistan combined. We hear very little about the personal hell soldiers live through after returning home.